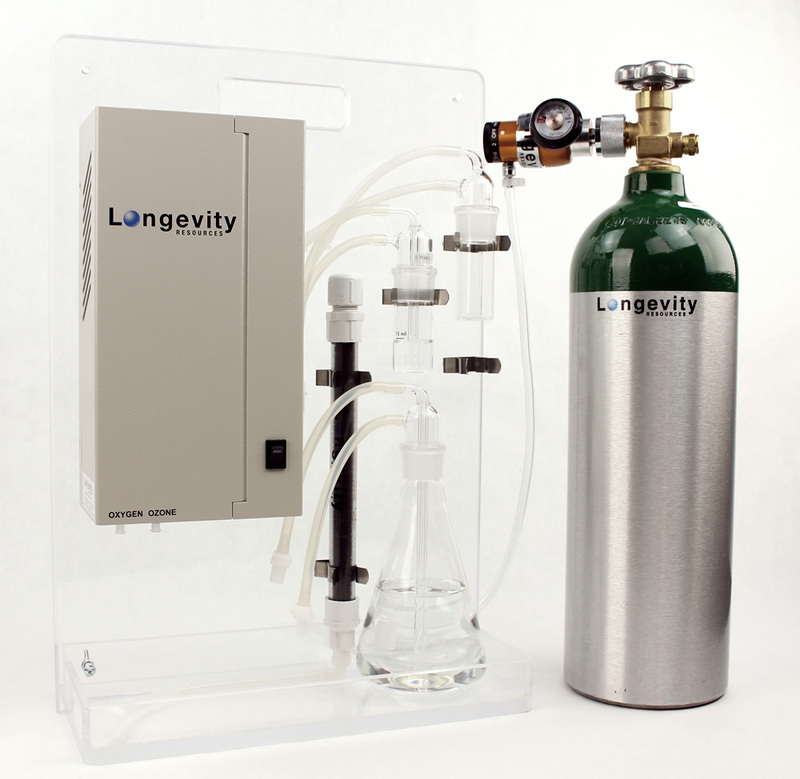 Longevity's "Entry Level" Ozone Generator, the EXT50 comes with a wide range of ozone concentrations and yes, Longevity's NEOS™ Technology and 100% Quartz Glass Electrode for UltraPure Contaminant Free Ozone. Suitable for anyone interested in Medical / Dental / Laboratory Research Applications the EXT50 is "Commercial Quality" at an "Outstanding" price. With your purchase we provide Proof of Quality (QAI Approved), Purity, and Precision, plus the best Customer Support in the industry. Longevity's 100% Quartz Glass Electrode ensures the ozone never touches any metal, ceramic, plastic, rubber, glues nor resins that would otherwise contaminate the ozone. We've exceeded even the International Ozone Standards. This is the reason you receive just pure contaminant free ozone. We've even proven it through 3rd party laboratory testing. Longevity provides something no one else can, proven pure ozone. The EXT50 could not possibly be easier to use: Push the on button and you are creating ozone + owner's manual and videos to show you exactly how to use it. Longevity also includes a complete easy-to-read Ozone Output Chart to show you exactly how much ozone you are producing. Use examples are included in the manual, and Lifetime Customer Support ensures you always have someone to call for assistance. After 20 years as leaders in the industry, Longevity has proven best in class Quality, Reliability, and Customer Support. Longevity goes the extra mile. We provide Proof of Purity (Independent Laboratory Test), Proof of Precision, plus independent laboratory testing and factory inspections by QAI.org Certification to CSA and UL Standards. 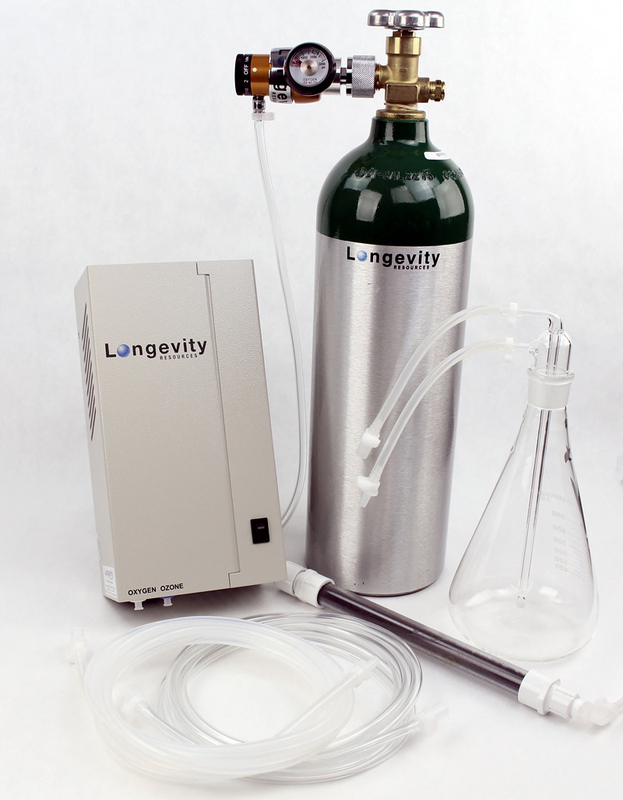 Longevity engineers set out in 1995 to build ozone generators that would last a Lifetime. Now, today, the earliest Longevity ozone generators are still in use 20+ years after they were purchased. We would say we are on the right track! Longevity ozone generators have earned a reputation of quality and reliability that you can count on. Now THAT's value! New to Ozone? No problem as Longevity provides LIFETIME Customer Support at no extra charge. How long does that offer last? As long as you own the EXT50 Ozone Generator, and based upon our "Built to Last a Lifetime" comments above, you can bet that will be a very long time! Relax, you are with Longevity Resources now. or add any items you like from our extensive list of Ozone Accessories to create an ozone system that exactly meets your needs and your budget. More Accessories Means You Can Do More! 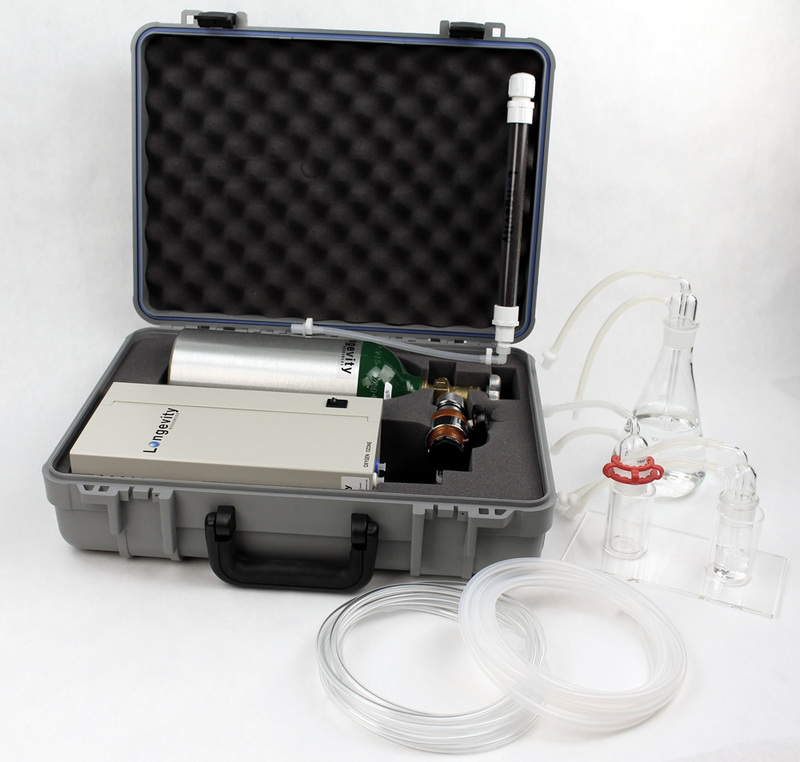 The EXT50 Complete Ozonation System Contains More Accessories for More Protocols (Portable Briefcase System)! More Accessories Means You Can Do More! Handy Panel Mount. The EXT50 Complete "Panel Mounted" Ozonation System Contains More Accessories for More Protocols! Plexiglas Mounting System - Use as Wall Mount or Table Top Stand Holds the EXT50 and Accessories! Large 640 Liter Oxygen Tank - Still "mobile" but large capacity for extended use before refill! You'll find the EXT50 Ozone Generator has phenomenal benefits, is super easy to use, high quality (proven) and reliable. All of these characteristics have made it the Number 1 Ozone Generator recommended by Professionals for Personal Use (But you can use it for "all day" commercial and research use too!). Proven: Pure Contaminant Free Ozone. Longevity Ozone Generators are the only ones in the world that come with a Certificate of Purity of the Ozone. Our 100% Glass Electrode ensures the ozone never metal, ceramics, plastics, rubber, nor glues nor resins that exist in other ozone generators, materials that would otherwise add contaminants to the ozone. This is why Longevity Ozone is uniquely pure and contaminant free! Proven: Precise Ozone Concentrations. Each Ozone Generator arrives with a Certificate of Precision and a Precision Ozone Output Chart, precise down to 0.1 ug/ml (the most precise in the world). The Output Chart is created using the oxygen regulator that comes with the ozone generator to ensure ultimate precision. Proven: High Quality through a 20 year reputation of proven reliability. PLUS Rigorous inspections are performed on Longevity ozone generators by an independent laboratory company called QAI (Quality Auditing Institute). Longevity's ozone generators passed these rigorous tests earning them Certification to North American CSA and UL Standards. The EXT50 is also Certified to European CE Standards. You can buy with confidence! The EXT50 Ozone Generator produces 1 - 65 ug/ml of UltraPure Ozone. We've intentionally calibrated the EXT50 to produce the most popular ozone concentrations, at the most popular flow rates, and provides you with almost twice as many choices of ozone concentrations as other 'single button' ozone generators. This makes the EXT50 the highest quality most useful 'single button' ozone generator on the market today. You wil be thrilled! All digital NEOS™ Technology Silent Pulse Injection is the most advanced in the world, a low power (only 0.4 amps) 'cool' process that generates pure ozone, and no heat. The 100% Glass Electrode, yes a single electrode, produces more ozone than any "double electrode" ozone generator, displaying clearly superior technology. Longevity's Proof of Purity test proves we provide the purest ozone in the world. Nothing could be easier. Longevity offers our Lifetime Warranty on each ozone generator PLUS Legendary Lifetime Customer Support via our Toll Free telephone service and via email. Longevity's highly trained customer support staff are friendly, happy, and ready to help you to set up or use your Longevity ozone system. The EXT50 Ozone Generator is light, all digital, small and compact at 11"L x 6"W x 4.5"D (280mm x 145mm x 110mm) and only 4 pounds! The EXT50 easily fits on any counter top, laboratory bench top, and can even be hung on the wall, or placed into Longevity's handy briefcase for transport or safe keeping. The EXT50 is available by itself (for those who already have ozone accessories), or purchased as a Basics, Essentials, or Complete Ozone System Package. Choose an optional Plexiglas Stand for wall mounting or choose the Briefcase for easy carrying and storage. Want to custom create a package to fit your budget and needs? Our Product Specialists would be pleased to help you do that! Call us for information or email. The EXT50 is conveniently capable of accepting "Universal Voltages" of 100 - 240 volts, 50 and 60 Hz. Regardless of which country you live in you can plug it directly into the wall socket. For those "off the grid" low power of less than 0.4 amps means it will fit into your lifestyle (and will never heat up). Remember the Proven Quality section above that mentions QAI Approval? Well QAI also tests the ozone generators rigorously to ensure they are SAFE for everyone to use. QAI (Quality Auditing Institute) PROVEN Safety and Quality proves to you that you are purchasing the "Best in Class" product even before you receive it. How comforting is that! The attractive tan colored powder coated metal cabinet not only protects the ozone generator components inside, but also protects you from EMF fields. The EXT50 is therefore not only high quality and good looking but proven to be Super Safe too! Simply another reason to trust Longevity's phenomenal high quality and QAI Approved Ozone Generators for all of your ozone needs. Super easy to use. The ozone output is intentionally set at the most useful levels up to 65 ug/ml, offering almost double the choices of other generators in this class. Don't know what that means? No problem, we also give you Lifetime Customer Support free of charge. Any company can say their ozone is "ultrapure". But only Longevity can prove it: Ozone Tested for purity by an independent laboratory and no contaminants found. A Proof of Purity certificate is provided with every ozone generator so you can be confident and assured the ozone is pure. A unique form of Cold Corona Discharge called NEOS™ Technology uses low power (only 0.4 amps) produces no heat, proven pure ozone and proven quality with Longevity generators are in use 20+ years! Plus Certified to European CE, and North American CSA and UL Standards. 11"L x 6"W x 4.5"D (280mm x 145mm x 110mm). Lightweight only 4 lbs (1.8kgs). Easily fits on any counter or bench top; can also be wall mounted. Accepts Universal Power 100 volts - 240 volts, 50 Hz - 60 Hz for true "international" use and travel. Suitable for every country. Accepts concentrated oxygen from an oxygen tank or oxygen concentrator. Can be used with an 'air pump'. Any company can 'say' their ozone generators are high quality. But only Longevity has a reputation for ozone generators running reliably for 20+ years. Add to that, our ozone generators have been submitted to rigorous testing by QAI.org, an independent laboratory, for testing and Certification to CSA and UL Standards. You can purchase with confidence! Longest warranty in the industry with Lifetime on the Quartz Glass Electrode and 5 Years on all other components. Generators proven to last 20+ years, plus Lifetime Access to Longevity's Legendary Customer Support. Customize a package to suit your unique requirements and your budget, or purchase a 'ready made' package. You are in charge.